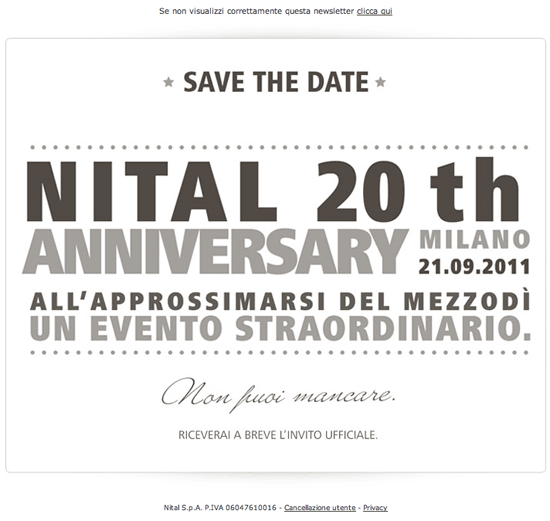 Nikon Italy (Nital is the official import company) sent out invitations for their 20th anniversary celebration that will take place on... September 21st in Milan, the same date as the "Nikon in White" event in Vienna. "Evento straordinario" from the invitation means "extraordinary event". The invitation is also available online. Maybe just another coincidence, but September 21st is rumored to be the announcement date for Nikon's new mirrorless system. "All' approssimarsi del mezzo di' ", means "at around noon"
"Non puoi mancare", means "you can't miss this"
"Riceverai a breve l' invito ufficiale", means "you will receive the formal invitation to the event shortly".